Books are not written or read in a vacuum, and we find meaning in them from how they make us feel or the connections we make to them. I would argue that the appreciation of literature happens when you understand the context to past experiences and social norms. I believe books come into our lives at just the right moment, filling a need we were not even aware we had. I buy more books than I can consume, and even though a title may sit on my shelf, unread (sometimes for years), I know that when I finally do, it will be at just the right time. I don’t believe you can read a book at the wrong time. As I have gotten older, I've learned that we all have stories to tell and that I want to share my story with you, through the books that have moved me. I hope as we continue on this journey together, my story will move you and collaborations will form from it. I started this site to highlight a lack of awareness of black literature. 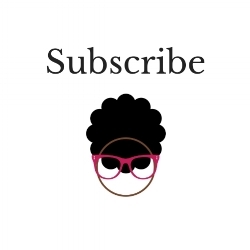 Black and Bookish is my personal blog site and is my exploration into Black culture through books and other art mediums. Although there is an abundance of books and media created by people of color, especially here in the United States, these creative outlets are less recognized. The theme of adversity over oppression feels to be the most common, and it comes in many different forms. Over the past year, there has been a resurgent of outward black pride, and focus on the love of one's self, especially in children's literature. I feel that pride in my home, and in my community; however, I do not see it reflected back in my local bookstores, movie theaters, or art galleries. So I created a space to share that pride with you. Not your typical reviews. Like everyone else, I love to get lost in a good book. But you won't find any "stars" on this site. That's because Black and Bookish is less about best sellers and more about how I connect to these stories. Why focus on women? Why not? Really, it's because black women have been failed in so many ways by society and media. If anyone needs a new narrative, I believe it would be written by a black woman. Top Ten for the Weekend. These are my Friday posts to summarize my bookish week. This is where you can find a rundown of the books I acquired and what books I finished. Sometimes, I’ll also include articles of interest. What Exactly Are Bookish Thoughts? These are non-review, opinion posts. Of course, books will always come into play, but in a broader sense. #SipandRead Photo Series. I drink coffee in the morning. I drink wine in the evening. Inspired and featured on Instagram. Independent Authors. Even the little guys have stories to tell. I hold a special place in my heart for local and independent writers. There is no doubt that they will. I am constantly looking to update and improve my thoughts, so don't be surprised when new categories show up and old ones are phased out. Don't let this alarm- this space is a work in progress. My main goal is to provide solidarity and comfort here. I am looking for clarity. Maybe you'll find some too.